Old School At The Corner Of 30th Street And…. Divided back, unused, Real Photo Postcard. Circa 1910s -1920s. AZO stamp box. A Real Photo Postcard from maybe the 1910s – ’20s of a parochial school somewhere in the United States (per the American flags in the windows that the kids made.) One figures it was probably not taken in the Southwest, due to the building style: brick and lots of them, a four-story building. As for the parochial, there’s the cross at the top. We see streetcar tracks, a number of kids (and you can see how the camera couldn’t capture the images of the ones in motion) and a few adults. 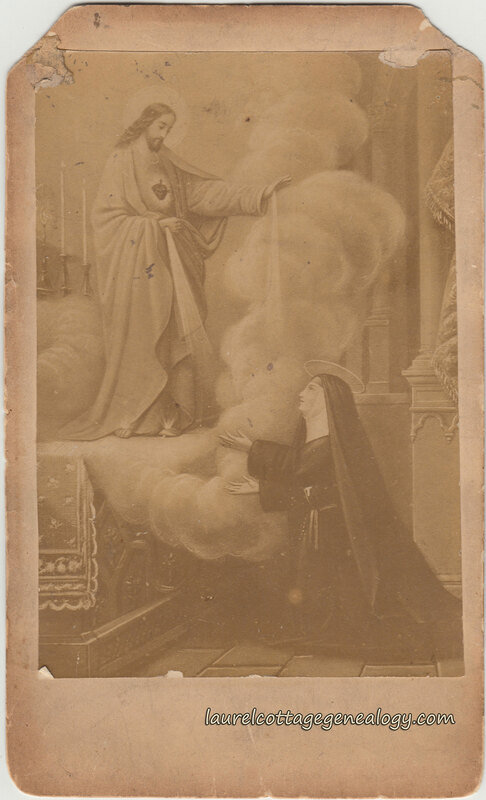 There are two major clues to the name and location of this school, which both remain a mystery: the nun in conversation with the policeman or fire chief – her style of habit should identify the religious order, but nothing was found online; and the street sign. Maddeningly (!) 30th St. is easily read but the almost-discernible cross street….what is it? 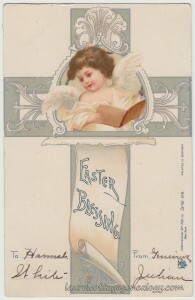 Here’s another beautiful Easter card; this one showing a dark-haired angel holding a book, and gazing down to her right. 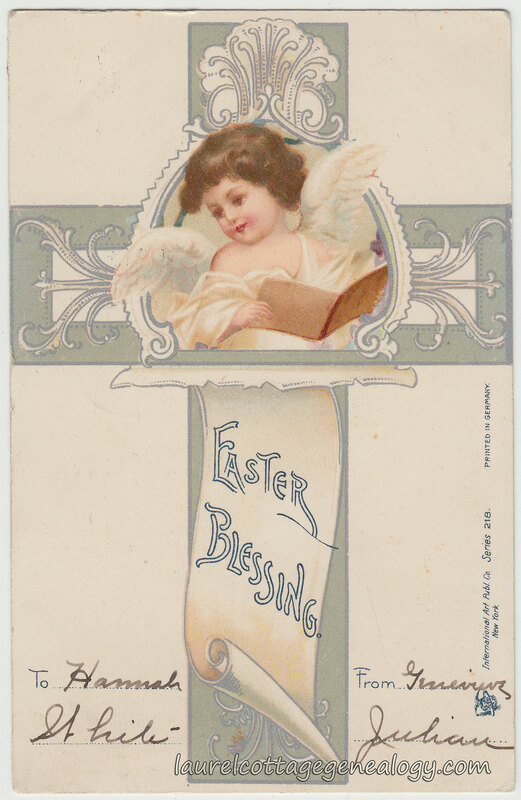 She is situated in the center of a silver cross with ornate scroll work and the unfurled message, “Easter Blessing.” The publisher included a space for “To” and “From” to be written in by the sender. So, it was Hannah White that sent this card to Genevieve Julian. 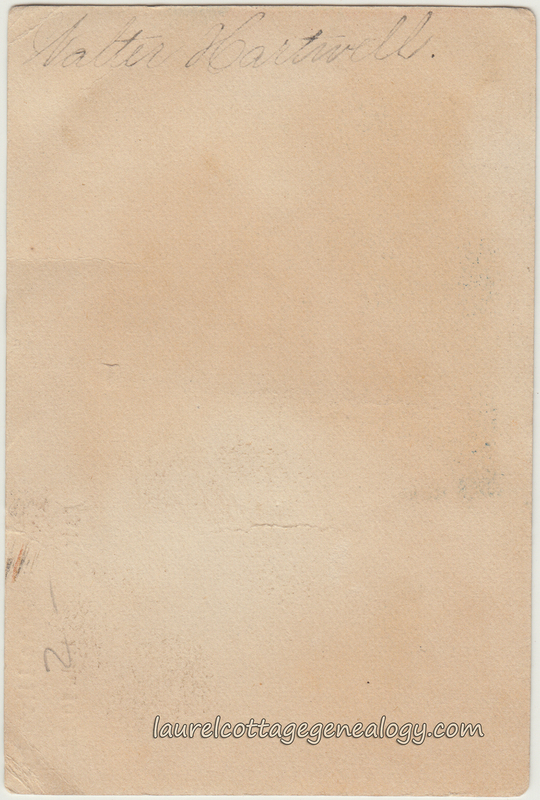 The outgoing postal mark shows Fruto, Cal. Fruto is an unincorporated community in Glenn County; about 14 miles northwest of the city of Willows. There is a “Jenevieve” Julian, born July 1875 in California, appearing on the 1900 Federal Census for Glenn County, CA. This record shows she was married to Lee Julian, and they were staying with his brother, William Julian. 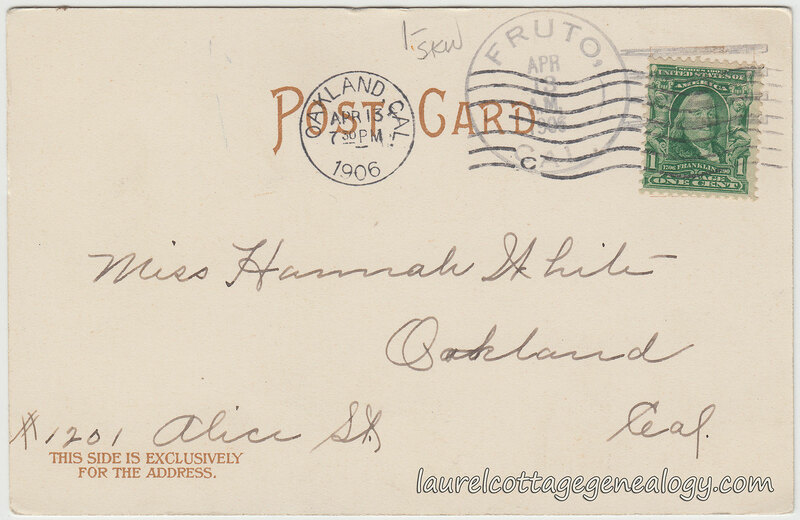 So, Genevieve would have been about age 30 when she sent this postcard to Hannah…As for Hannah, she does show up on the 1906 city directory at 1201 Alice Street, but no census records were found with the same address. Undivided back, used postcard. 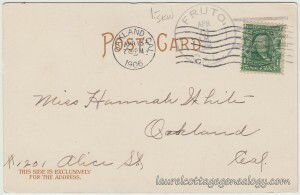 Postmarked April 13, 1906 from Oakland, California. Publisher: International Art Publishing Co., New York. Series 218. Printed in Germany. Sources: Fruto. n.d. http://en.wikipedia.org/wiki/Fruto,_California. (accessed April 5. 2015). 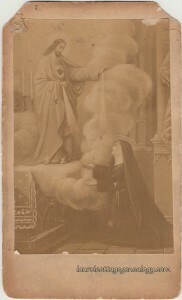 Old card, circa 1890s – 1910. Small card with bible verse, possibly from the Victorian Era. Maybe it was used as a calling card. It has the name Walter Hartwell written on the back. This wonderful image was surprisingly hard to describe at first, but denotes faith. The verse, combined with the image, to me means that the continued practice of honesty and kindness bring faith, faith then carries us and protects us, allows us to see the sweetness in life and to know that we are never alone. 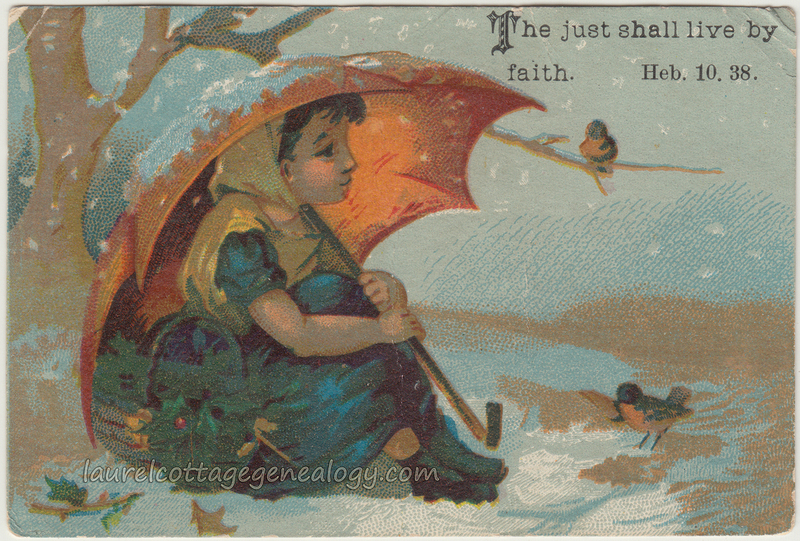 The card shows a little girl in winter taking a break from picking holly (per the basket beside her). It’s lightly snowing and she is sitting on the ground, under her umbrella, which is keeping off the snow. Two birdies have come to greet her. Though she is not dressed in fine clothes or even very warmly, we can see by her beautiful expression that she is spiritually rich and walks in faith. 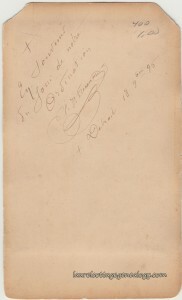 Translated as “In Memory of the Day of our Ordination” Signed P.V. Frecenon, November 18, 1895. There are many entries in the Detroit City Directories for a Rev. Joseph Frecenon, who appears to be the same person as the Rev. Francis J. Frecenon, but we would think that this would not be the same Fr. Frecenon that signed this card. According to a Chippewa Falls, Wisconsin biography, the Rev. Joseph Frecenon was born in Martinique, West Indies, July 27, 1851. He was ordained October 28, 1874 in Paris. He was at Cellule (France) for one year. He spent sixteen years at “St. Pierre, Miquelon” (St. Pierre and Miquelon are two French territorial islands south of the coast of Newfoundland), after that was in Beauvais, France. He was then assistant pastor at St. Joachim Parish in Detroit. (St. Joaquim is now a closed parish. 1885 – 1989) After serving at St. Joachim he went to Chippewa Falls, Wisconsin, and was pastor there at Holy Ghost Church. In September 2013, I contacted the Archdiocese of Detroit for help on solving the P. V. Frecenon mystery. I was graciously contacted back by their Archive Dept. 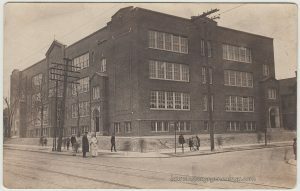 and informed that in 1895 Detroit did not have it’s own seminary, so priests serving in Detroit at that time would have been ordained elsewhere. In addition, I was informed that our Fr. Frecenon did not end his ministry in Detroit, as the Archdiocese has no file on him. P. V. Frecenon’s identity remains a mystery for now, and this is a prime example, especially relevant in the field of genealogy, that things are not always as they appear. 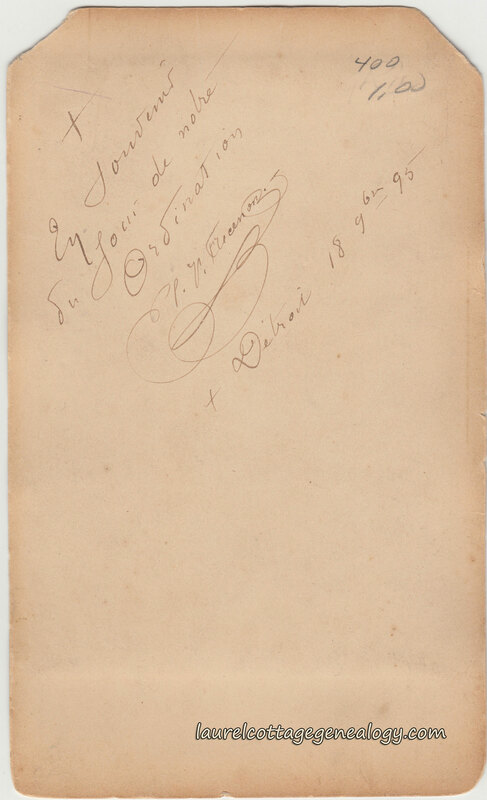 The date that Father Frecenon signed the card was November 18, 1895, “9bre” being at that time a standard abbreviation in french for November. (7bre – septembre, 8bre – octobre, 9bre – novembre, 10bre – decembre). I will have to search for the keystroke to make the “bre” smaller with the underline as it was actually written. The card was found in an antique store in Dearborn, Michigan. Roman Catholic Archdiocese of Detroit, Archives Department. Detroit, Michigan, email contact September-October 2013.